Whenever we travel seems like we always take along a cast of characters, more than just me! One such person was Lloyd Jessen who hails from Iowa. Lloyd loves design whether it is in his garden, home or creating a special gift for us to travel to France in style. Thus, before we left, he gathered names and sizes and created a tee shirt for each of us as a memento of the trip. And today was the day for a great group photo op. 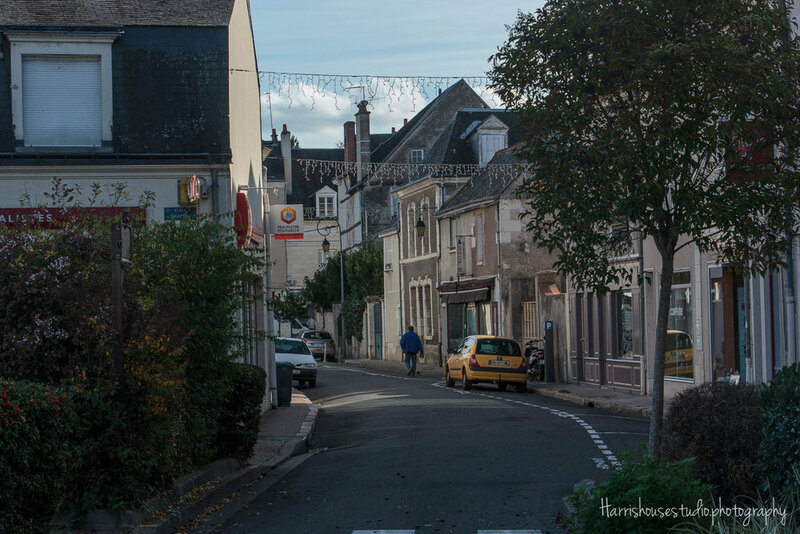 Traveling north from the Château de Chenonceau, we arrived in the town of Amboise. Here was the home of the 15th Century Château Royal d'Amboise. The château was the place of residence for French kings from the 15th to the 19th centuries; its destiny is inextricably linked to the history of France. Numerous literary figures and artists were invited here, like Leonardo da Vinci whose tomb is preserved at the château. This château is situated on the hill overlooking a spur of the river Loire. We walked through the town and up the carriage path to the great castle. It is said that approximately 75% of the original castle remains which is quite astounding given its connection to the royal court and the French Revolution, as well as two world wars that saw various amounts of damage. After our photos we walked the grounds and the palace itself. Lloyd found the statue of Leonardo and they chatted for awhile in hopes that some of that creative genius would rub off on each other (!). Lush, well manicured gardens surround the buildings as we made our way through the property and descended back into town. The little town of Amboise hosted us for lunch and was a perfect example of a sleepy little French town: tree lined streets, sidewalk cafes, and quiet cobblestoned streets and the gazebo. A glorious day - thank Llyod for the gift and the memory!